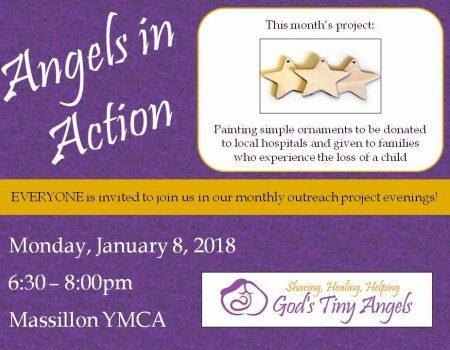 Starting in 2018, God’s Tiny Angels Support Group is proud to announce our new outreach program, Angels in Action! On the second Monday of every month, we invite everyone to participate in an outreach project evening. These projects will include making no-sew blankets, painting simple ornaments, creating sympathy cards and more. These items will be donated to area hospitals and to local grieving families. Angels in Action will be in place of our current monthly support group meetings to allow more people to become actively involved in helping those who are grieving a loss. We’ve had many people ask us how they can help our cause and this is a wonderful opportunity! Everyone is welcome. This group is open to anyone (men, women, and couples) who has experienced the loss of a child through miscarriage, ectopic or molar pregnancy, stillbirth, SIDS, or infant death. This group is also open to those experiencing any type of fertility challenge and for those who are supporting someone going through such challenges. *Childcare is available for $2/hour for children 6 weeks through 8 yrs of age. GTA Support Group refers individuals to businesses that provide burial services at minimum to no cost as a community service. We also provide assistance with burial fees as funds are available. In addition to our pregnancy and infant loss support group, we also provide grief support via our website. A variety of grief related articles, poems and resources are available . Click on Articles & Poems and/or Helpful Links at the top of the page. Each year in October our organization hosts a walk-a-thon in honor of our angels and to commemorate Pregnancy and Infant Loss Remembrance Day (October 15th). It is also our largest fundraiser of the year. Funds raised from this event help us continue providing assistance to bereaved families. Click the Walk-A-Thon link at the top of the page for details.